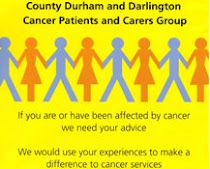 The County Durham and Darlington Cancer Patients' and Carers' Group (CDDCPCG) is a Locality Service User Group for the Network Service User Partnership Group (NSUPG). The Northern England Strategic Cancer Network (NESCN) believes that user involvement is central to cancer service developments and supports the principles and aims of all the National Cancer Strategy documents including the series of Improving Outcome Guidance, Cancer Plan 2000, Cancer Reform Strategy 2007 and Improving Outcomes: A Strategy for Cancer 2011. The CDDCPCG and the NSUPG are an alliance between service users and health care professionals and are led by service users. The role of the CDDCPCG is to influence cancer services within County Durham and Darlington by using patient and carer experiences. A maximum of three representatives from the Group will be on the NSUPG of the NESCN. The role of the NSUPG is to influence cancer policy and services and to ensure the user and carer perspective is integral to all aspects of cancer service developments throughout the NESCN area. The Group will not act as a support group. Membership includes service users (ex-patients, patients, carers or family members) and health care professionals. Whenever possible different cancer experiences and tumour sites should be represented. Membership is open to service users who either live in the County Durham and Darlington area or have received treatment at a County Durham and Darlington Foundation Trust hospital. Any issues relating to other Foundation Trusts within the NESCN will be referred to the NSUPG. Wherever possible there will be four officers, a Chair, Vice-Chair, Secretary and Treasurer who will be nominated and elected annually. NSUPG representatives will be elected from the CDDCPCG with elections taking place every two years. The term of office for NSUPG representatives will be a minimum of one year and a maximum of two, although members can be elected for a further year. To provide a patient and carer viewpoint to those making decisions about local cancer services. To raise awareness about the importance of user involvement and what it can achieve. To seek active engagement with all organisations involved in delivering care across all aspects of the 'cancer journey'. To maintain links with other cancer groups, including support groups. To work in cooperation with health care professionals. To provide accurate and practical information but not to give medical advice or make recommendations inappropriately. The Group will not endorse specific products or therapies nor is it able to recommend specific support groups. To ensure that everyone within the Group understands and respects confidentiality. This will include representation on the NSUPG and other relevant Network events and groups, i.e. Network Site-Specific Groups (NSSG) and Network Cross-Cutting Groups (NCCG). A maximum of three user representatives from the CDDCPCG will be elected to the Cancer Locality Management Group for County Durham and Darlington. The Group will produce an Annual Work Programme. This will include the priorities identified in the NSUPG Work Programme. The frequency of meetings will depend on the Work Programme. There will be 4 meetings per year. Minutes will be circulated to all members of the Group and the NESCN. Members will be eligible to claim mileage to meetings using the same rate as used by the NESCN. Funds shall be held in a bank account for which there will be three named signatories. Any two signatories will sign cheques or mandates drawn on the Group’s account. The treasurer shall keep records of accounts of the Group, which will be audited by a suitably qualified person and presented to the NESCN. Essential telephone, stationary, postage and other agreed expenses will be reimbursed on submission of a receipt. If the Group decided that it is necessary or advisable to dissolve the Group, the chair will contact the chair of the NSUPG and appropriate staff at the NESCN. Any assets will be transferred to the NESCN.